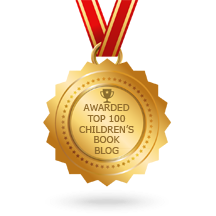 Today we are taking part in the Yogi blog tour! 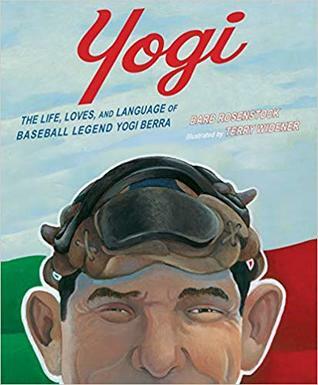 We are also giving away one copy of Yogi thanks to the generosity of Calkins Creek. To enter the giveaway, complete the form at the bottom the post. Yogi Berra, whose real nice was Lorenzo Pietro (Lawrence Peter) Berra was born on May 12, 1925 in a primarily Italian neighborhood in St. Louis, MO. Called Lawdie, this “short, big-nosed, funny-looking kid - one of the neighborhood boys who went piazza! - crazy - for baseball!” After World War II in 1946, Yogi was signed on to the New York Yankees. At first people made fun of Yogi because he was short (only 5’8”), had a big nose, talked funny (I want to thank everyone who made this day necessary”), and really wasn't that great of a catcher. ("We made too many mistakes"-Yogi Berra.) At the Yankees spring training that first year, a retired catcher worked with him. “After months of practice, Yogi took charge, shifting fielders, calming pitchers, keeping umpires on their toes. When he left the New York Yankees in 1963, Yogi had earned a World Series ring for each finger, more than any other player in history! Quotes of Yogi's are placed throughout the book. Widener’s colorful, cartoon-like illustrations, rendered in acrylic on Bristol paper, capture the mood and excitement of Yogi’s time playing for the minor and eventually major league baseball teams. 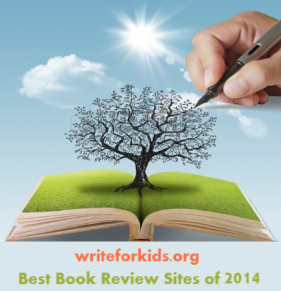 Supporting the text is an author's' note, stats for Yogi, a bibliography, and source notes. A loving tribute to one of America’s greatest ball players. Don't miss the other stops on the Yogi Blog Tour.